To get a true impression about the applicant, a faultless CV is significant. Being an advertising certificate, skills and attributes are mentioned on the resume which is presented to the employer. Job seekers rely on the internet mainly for job postings and applying them and hence they develop a resume which fits the electronic format. Apart from forwarding emails, a printed resume is something which is required to be possessed by all job quester. Professionalism and Propriety are predicted by the way a resume is printed and presented to the hirer. When discussing about a printed resume, there are a number of facets to be focused on. A few aspects are glimpsed below regarding resume printing. Though modern job seekers may have digital resumes as their assets, a printed resume has its own importance. In that context, the color of the resume paper plays a key role when printed. It is important to pick a resume paper box which would be the best fit for you as well as your work history. Picking the right resume color paper predicts your professionalism. Greater authoritativeness is presented with an almond colored paper, while docile and clean presentations are shown by ivory colored resume paper. In this manner, an elusive departure is presented with the color chosen rather than standard white colored paper. Almost all resume papers possess a unique texture which is cotton grounded material. So if you are confused on what paper for resume then apart from being a cotton based one, a linen based paper can make a better impression than a cotton one. Business papers are stiff and smooth as they have 25% cotton. The best suggestion would be resume papers of 100% linen. The textural experience with linen papers for a resume is excellent. The various other types of paper texture include coated, uncoated, laid and shiny. It is also experienced that linen paper on its top has textured lines which provide a formal look. Feel the texture and pick the right paper which you think would make your resume stand out of the crowd. A resume paper is usually heavier, solid and also sturdy than the usual. The other names used for paper weight is basis weight or paper density which measures the maximum amount of light that can pass through the sheet. The thickness and non-transparent feature of the paper avoid tearing of resume. The 24-pound paper is suggested for resume printing by Duke Career centre. A cotton-based resume paper is costly wherein restricted in quantity. 25 percent cotton based paper can be the best choice for the ones who require many resumes to be printed such as for a job fair or other event. To impress a single recruiter and make a strong impression, 100 percent linen resume paper can be the best investment. The rule for using a fixed resume size of paper is 8.5”*11”. This is because scanners are developed with the above-mentioned paper size of resume in mind, and filing units are also developed in the same manner. The envelopes are developed with this size of resume paper in mind. With all the above aspects in mind, the size of the resume paper is fixed. It is recommended to maintain the resume to one page, being concise is a good manner, but without leaving out the essential details. So a two-page resume can be perfect and acceptable. This would cover all the details a job seeker intends to convey the employer. The margins can be maintained at 7” at the top and 1” for left and right so that the printout of the resume is perfect. The type of printer to be used for printing is also important to be centred on. A laser printer can be the right choice for printing CVs. The intention for this choice is as the ink of laser printer turns damp it will not smear easily when compared to another type of printers. A laser print will also present your resume crisp and professional too. Apart from digging into and researching a lot for printing a professional resume, choosing the right envelope is also a tedious task. The envelope plays a key role where the envelope should match the quality and color of the resume printed. This makes your application look professional and neat too. 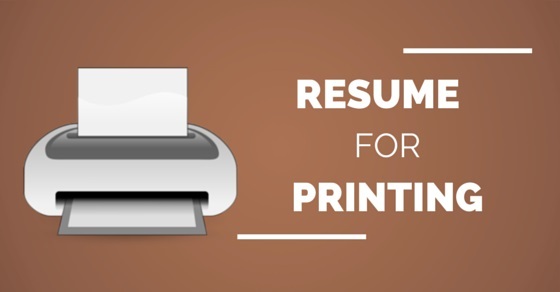 A resume should be printed on one side and not on the back side, if required a second page can be printed. The Northern Michigan University career development mentions that the resume can be printed and each page can be stapled together. Staples can be averted as they have the possibility to get mobbed in the sorting machines. A watermark is a type of mark or logo found on the resume paper when held in the light. These watermarked papers are costlier ones when equated with other papers. It is not necessary to use watermarked paper for resume printing. This category of paper would show the hirer that the job seeker has spent time and money on investing such high-quality paper for resume printing. The resume quality paper should be high. This just shows your involvement in making a perfect resume. The resume is advised to be printed in black ink only. Adding various colors and styled fonts would make your resume look unprofessional. This would make reading difficult and lead to rejection of your resume. Gray hues can also be avoided as mixing gray with black colored text can make your resume look gawky and unskilled. A well formatted and a professional resume is really important to make a mark in the interview. The manager for global staffing quality initiatives at General Electric mentions that they do not accept resumes papers of any quality. Ornamenting and designing the resume will only push your resume into difficulty and make it difficult for the employers to read it and hence all these negative points should be considered and debarred. The factors mentioned above predict the job seeker’s involvement and importance in printing a resume. The responsibility and prominence of presenting a professional resume is important.